As mentioned in the sneak peak of Lily’s room, I used twin sheets for Lily curtains. I had extra fabric to use and an old inexpensive Target lamp sitting in the attic. I wasn’t sure what else to do with the scrap pieces so I thought I’d give it shot. 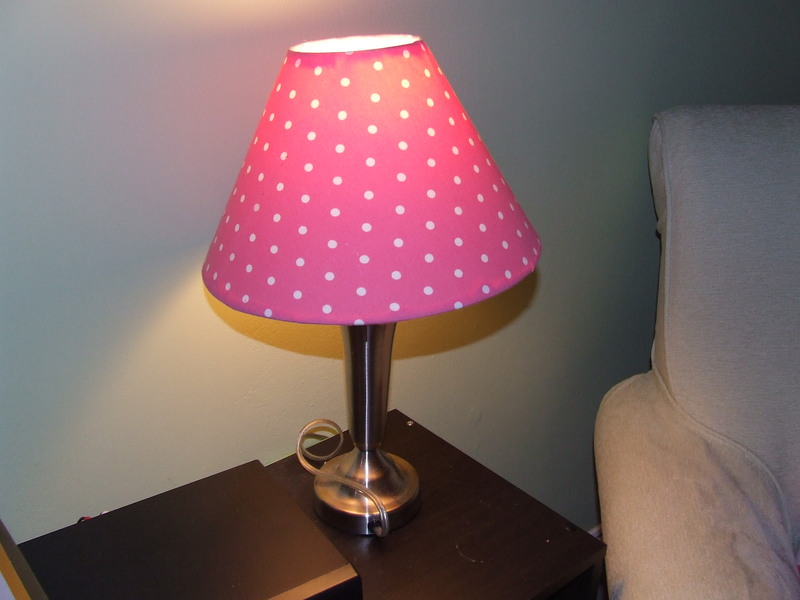 Below is a picture of Lily’s lamp shade. I didn’t take step by step pictures but a tutorial is coming soon. Check back soon (or join our mailing list) to get the instructions on how to recover a shade. In the meantime, Young House Love, provides a great tutorial on how to recover a round shade here. This lamp shade is my friend Kristin’s daughter’s lamp shade. I thought it was adorable that I begged her to let me share it. 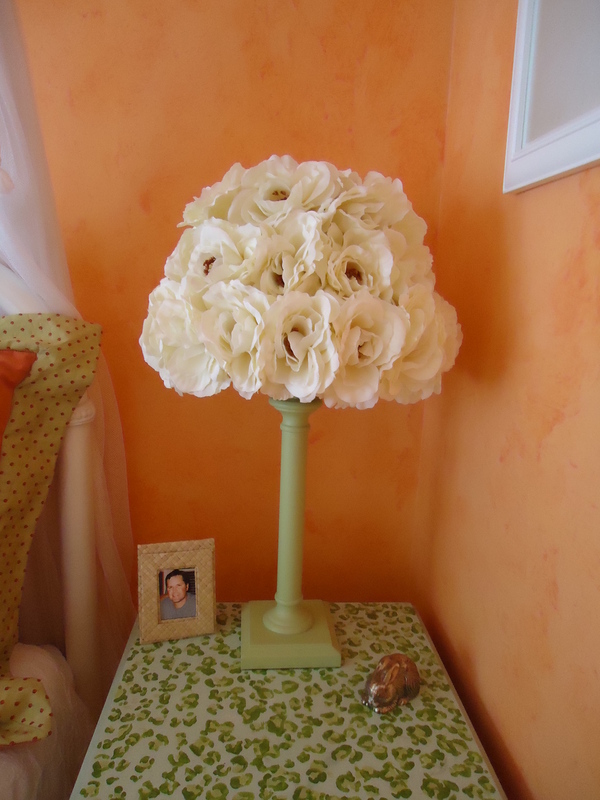 She embellished a Target lampshade with silk flowers from Walmart. She used a wooden skewer to poke holes through the shade and then she inserted the stems. You could also try spray adhesive or a hot glue gun as an alternative. It’s it adorable! Lastly, this is my $45 mistake. I hung a couple of swing-arm lamp shades from Lowes in our bedroom. With the first, I installed the wall plate backwards, which that in itself would have been ok (I could have unscrewed it and installed it correctly). The clincher is when I couldn’t get the lamp flush to the wall I applied threadlocking glue. Little did I know it was permanent. Walt talked to the guys at Lowe’s and they didn’t have a replacement part or a viable solution. The guys at Ace Hardware laughed at me then tried unsuccessfully to help me. I even tried to heat it (per internet instructions) with no luck. I finally gave up and decided it was a $45 mistake and I just needed to buy another lamp. Thankfully I didn’t purchase the more expensive Potterybarn lamp I desired. Lesson learned – the wall plate needs to be flush with the wall – I’m not sure what I was thinking. 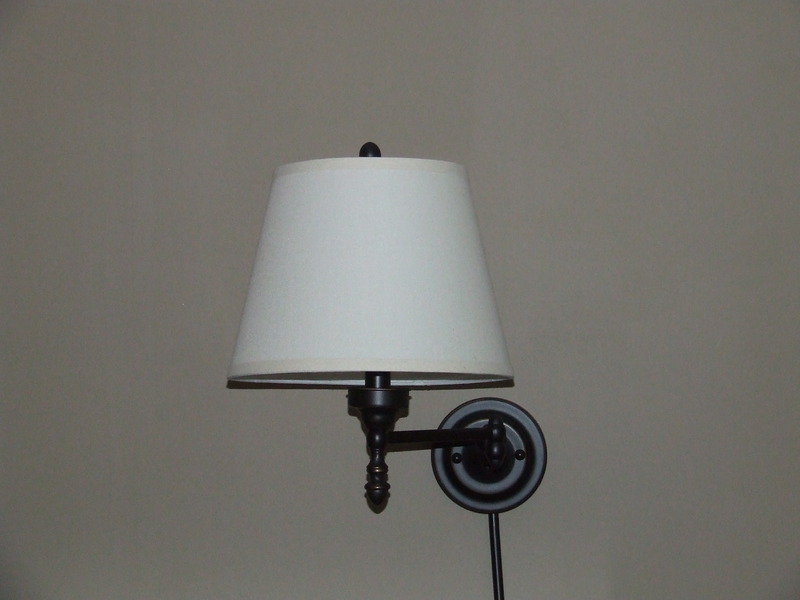 This entry was posted in Decorating, DIY Projects and tagged decorating, DIY projects, lamp. Bookmark the permalink. both lamp shades are very cute!!! question: for the roses one, does it greatly limit the light emitted by the lamp (i.e., is it for decorative purposes only)? Yes! Per Kristin, the lamp is fully functional and is the sole light source by the bed. Darker flowers might yield less light but the ivory blooms don’t pose a problem.